It is suggested that you start with Volume 1 of this series, because IBM z/VM® is the base “layer” when installing Linux on IBM z Systems™. Volume 1 starts with an introduction, describes planning, and then describes z/VM installation into a two-node, single system image (SSI) cluster, configuration, hardening, automation, and servicing. It adopts a cookbook format that provides a concise, repeatable set of procedures for installing and configuring z/VM using the SSI clustering feature. 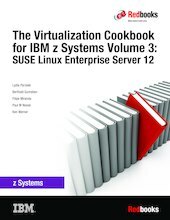 Volumes 2 and 3 describe how to roll your own Linux virtual servers on z Systems hardware under z/VM. The cookbook format continues with installing and customizing Linux. Volume 3 focuses on SUSE Linux Enterprise Server 12. It describes how to install and configure SUSE Linux Enterprise Server 12 onto the Linux administration system, which does the cloning and other tasks. It also explains how to use AutoYaST2, which enables you to automatically install Linux using a configuration file, and explains how to create and use appliances and bootable images from configuration files. In addition, it provides information about common tasks and tools available to service SUSE Linux Enterprise Server.